Uncertainty over access to paid leave is stressing out parents. Pregnant women are now discussing how to go into labour before the first of January. CANBERRA-- Oh baby! The Turnbull Government's proposed cuts to paid parental leave (PPL) are troubling some of the world's most stressed people -- soon-to-be parents -- and now, some pregnant mums are working on ways to bring labour forward. Social Services Minister Christian Porter says he wants to "get women back to work" and find savings in the system, but The Huffington Post Australia has found there's growing resistance to the renewed government push to stop new mums and dads "double-dipping"; that is, receiving government parental leave as well as paid leave from employers. The legislation, which was introduced in the House last Thursday, has three possible start dates. The first is January 1, just nine weeks away, so it could affect women in their last trimester. "I am stressed out," said 30-weeks pregnant Katie Barry, who is due to give birth to her second child, a boy, on January 1. "I have just over two months to my due date. I am a person who likes to plan and have a set plan in place. Now I have no idea what is going to happen," she told HuffPost Australia. "To blindside people and give them no warning I think that is just terrible." The plan, which Labor opposes and Nick Xenophon Team is still considering with a "cautious approach", may end up being blocked in the Senate, but it's the uncertainty which is causing extra parental stress. "It is all up in the air," Barry said. "The past few days I have been stressing so much I have made myself physically sick because I don't know what's going to happen. "I can't sleep at night. I am constantly thinking about it. What's going to happen?" How did we get to a point where women's due dates are giving them extra anxiety? The Abbott Government had offered the then Prime Minister's signature "gold-plated" six month paid parental leave scheme, but it failed to find support, including within the Coalition. The next, much less generous variation of the leave scheme was delivered by then Treasurer Joe Hockey on Mother's Day 2015. There you go. Paid parental leave, Minister Christian Porter says, is not for mothers to bond w their babies but get them back to work ASAP. The government's current scheme still provides 18 weeks at minimum wage for carers earning $150,000 or less. But that would go under the slightly modified plans released last Thursday if the parent at home gets paid leave from their employer. Minister Porter does not personally use the term "double-dipping," but has described the changes as a "re-balancing" of the paid parental leave scheme so more people, including those on low-incomes, will be brought into the system. The Coalition expects to raise $1 billion through limiting access to the scheme and the savings are expected to show up in the Mid-Year Economic and Fiscal Outlook (MYEFO) later this year, even if the legislation gets stuck in the Senate. Australia's "paid parental leave" scheme is just a baby bonus paid in instalments. A very meagre scheme. Katie Barry's work in the financial sector offers her three months paid maternity leave, but she was hoping to take six months off, possibly a little more. 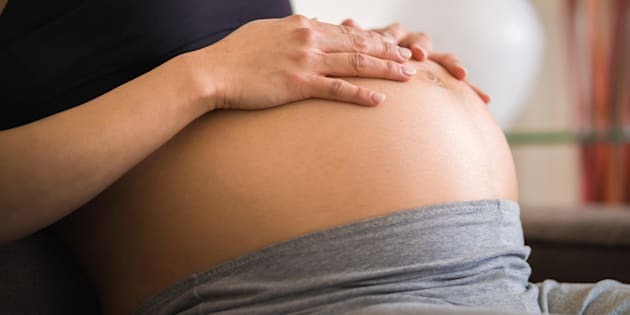 She's now among thousands of pregnant Australian women now rethinking well laid plans for managing motherhood and work, and considering her due date coincides with the possible changes, giving nature a push is a live option, as long as it would not harm the baby. "I would not doing anything to purposely bring on labour," Barry told HuffPost Australia. "I am going to do the safe things such as going for a walk, eating spicy food that sort of stuff, praying to everybody that I could pray to that the baby does come earlier." "Especially being due Jan 1. It is potentially one day difference whether or not to be eligible to receive the payment or not." Adelaide based sales executive Chloe Cane is six and half months pregnant and "quite anxious" about the proposed cuts to the paid parental leave scheme. She's told HuffPost Australia other mothers who are due around January 1 are discussing bringing on birth. "So I think that could have an impact on parents that could possibly end up doing things that could possibly be a danger to themselves and their kids." Barry is also concerned for other women and babies. "I think it is definitely going to increase the amount of women that would do things that aren't recommended such as the castor oil," she said. "I have heard that doing that can induce labour but it is quite dangerous. "Money makes people do crazy things." Parent advocacy group The Parenthood is not surprised. It wants the Turnbull Government to go back to the drawing board as it says Australia already has one of the least generous PPL schemes in the developed world. The Parenthood's Executive Director, Jo Briskey expects caesarean sections will be rescheduled if the legislation passes. "(Obviously) they would be doing it in consultation with the doctor to ensure there would not be any harm to the baby," she told HuffPost Australia. "But if it is possible, they would be looking to do that." "These are the real life consequences and it shows how important this leave is, how vital it is to these families. "It is insane. It is awful, awful that they would feel they would need to do that." Labor's families and social services spokeswoman Jenny Macklin claims she and her office have spoken to many concerned mothers about the Turnbull government's planned cuts to paid parental leave. "I have no doubt that people are very frightened," Macklin told HuffPost Australia. "People have already organised their leave. People have worked out their finances with their partners, their employers and now all of their arrangements have been thrown up in the air. "We would not want anybody to do anything which would endanger themselves or their babies, and I am sure nobody would do that, but that is why it is outrageous what the government is doing. "The government plainly just completely out of touch with the enormous disruption that they are causing." The Social Services Minister has been sought for comment by HuffPost Australia. As she awaits birth, Chloe Cane regards the Government as "confused" on the subject of families. "They always talk in the government about how they recommend that a parent be a stay at home parent for the first six months and establish breast feeding and establish that connection with you child, but they are not prepared to pay us to be at home for that amount of time," she said. "Some people have the opportunity to work for a company that does give them the option to have the maternity leave. I know not all employers do that. "But just because we work for somebody that does do that, why should we be punished?"